Flat, two-dimensional photos are old news. The future is 360-degree photos that let you look around in any direction from a single standing position. You can share 360-degree photos everywhere from Facebook to Street View, and unlike 360 video, they can be easily snapped using the phone you’ve already got. Here’s how to get started. First, you need an app. The one you want depends on where you’re sharing or storing the picture, but most platforms work with most apps. The best app for the job is Street View for Android or iOS, but you can also use the photo sphere mode in the stock Android camera or Surround Shot mode on Samsung phones. The Street View app is a lot like the photo sphere mode offered by the stock Android camera. Tap the large orange plus icon then pick Camera, at which point the app will guide you through the capture process—basically you have to stand in one place and hit all the orange circles to fill the orb at the bottom. Images are snapped automatically when you reach each designated position (no need to press the shutter button), and once you’re done, the app does all the hard work of stitching together the images you’ve taken. If you’ve got Google Photos installed, that’s one of the apps that will be able to show your 360-degree photo in all its glory. If you’re on a phone, you can view a photo by moving the handset around to change the view (or tapping and dragging). If you’re in the browser mode of Google Photos, you can click and drag using the mouse. If you want more people to see your immersive image, you can upload it to Street View or to Facebook in the same way as any other photo. At the moment Android is more 360-degree photo-friendly than iOS, but Apple will most likely catch up. 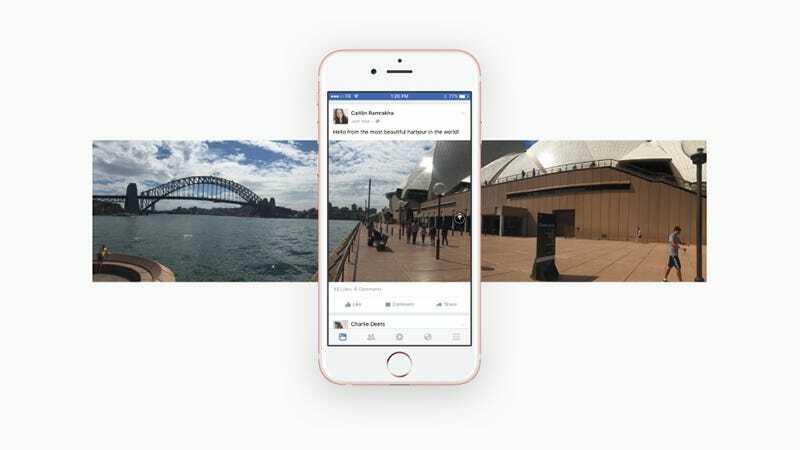 Facebook can process iPhone panorama pictures as 360-degree pictures, or you can use a third-party app (such as Street View or something like 360 Panorama). Of course you can pick up a dedicated 360-degree camera if you prefer, which will let you shoot video clips too.